Hirschdale, CA. Near Boca Reservoir. 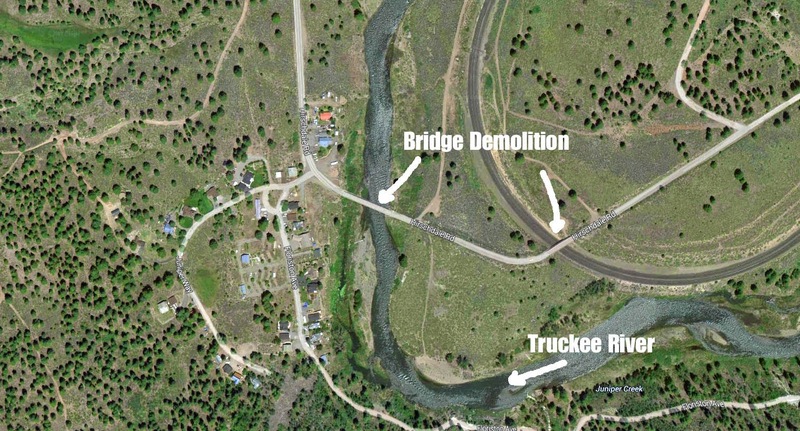 Nevada County is moving forward with plans to demolish two bridges 6 miles east of Truckee in the area of Hirschdale. The two bridges are on Hirschdale Road as it crosses the Truckee River. The bridges provide access to a recreation area north of the Truckee River. The Tahoe-Pyramid Bikeway has plans to use the bridges in their 116 mile bikeway from Pyramid Lake to Lake Tahoe. Over half of those 116 miles have been completed. Leaders of the Tahoe-Pyramid Bikeway call the proposed bridge removal a “serious negative effect” on the bikeway. The plan to remove the bridges will cause an additional 4 mile detour and a 500 foot climb. The budget for bridge removal is $5,818,419. Nevada County wants to remove the bridges for “safety” and “liability” issues. Both bridges were built in 1926 and the County has no plans to replace them. Nevada County does have plans to improve access to the area served by the bridges by making improvements to W. Hinton Road (Boca Quarry Road). These improvements to Boca Quarry Road will do nothing to replace the bridge loss for the Tahoe-Pyramid Bikeway. Could the bridges be closed to cars and kept open for foot and bicycle traffic?